Robert Wilson takes a very hard-headed look at the state of the global energy system, in particular at the US and China. He comes up with some stunning conclusions. 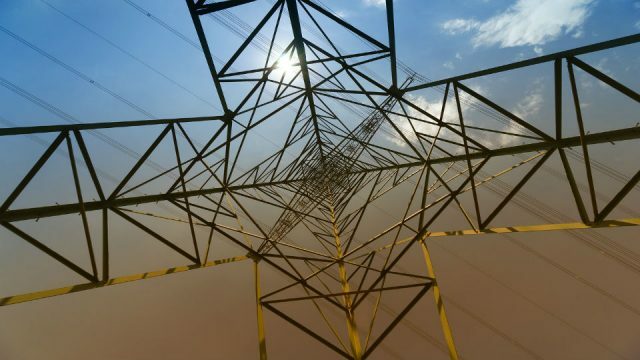 America’s per-capita energy consumption, he argues, is excessive and could easily be halved without any negative impact on the standard of living. But no matter what the US does, China is already by far the largest energy consumer in the world. And unfortunately, despite taking some positive measures, China will not be able to reduce its fossil fuel use or carbon emissions over the next decades. Chinese coal consumption, for example, is highly unlikely to decline over the next 30 to 40 years. Meanwhile, the sales of sport utility vehicles in China is increasing by one million a year. Get ready for a rough ride. In 1999, the International Energy Agency produced its annual forecast of the future of global energy production and consumption. Here is what it predicted would be China’s annual carbon dioxide emissions in the year 2020: 7,081 million tonnes. In the real world, i.e. not the one that exists in the spreadsheets of the IEA, China’s carbon dioxide emissions had already reached 8,271 million tonnes by the year 2010. This is a mere 17% higher than the IEA predicted they would be a decade later. It is also 55% higher than it predicted they would be that year. So much for our abiltiy to forecast the future of energy consumption, even over timescales as short as a decade. This rapid growth of China should be contrasted with the relative decline of America. Who would have predicted a decade ago that, in the absence of any real climate policy, America’s carbon dioxide emissions would have declined by 10% between 2005 and 2012? The main reasons for this – economic collapse and the diffusion of shale gas – were not exactly at the top of the many turn-of the millenium forecasts by the world’s quick to prophecy pundits. But this much is obvious: China has now passed America and is now the most physically important country on the planet. No other country has a more important influence on the biosphere, whether in terms of what we take from it or what we dump in to it. Here I will demonstrate this point by making simple and illustrative quantitative comparisons between China and America’s materials and energy production and consumption in the early 2000s with those of today. China’s rapid urbanisation, and industrialisation, has some obvious requirements. Roads, houses, hospitals, power plants all require concrete. Even individual pieces of infrastructure can require astounding amounts of concrete. Three Gorges Dam required the poring of 16 million tonnes of it. China has taken less than a decade and a half to build electricity capacity the equivalent of the entire American grid. And by concrete we really mean cement. China now produces, and consumes, approximately 60% of the world’s cement. These figures are not merely incredible but close to being literally unbelievable. Between 2002 and 2012 China’s annual cement production grew from 725 million to 2,3000 million tonnes. That is the equivalent of an annual average growth of over 150 million tonnes. Only two countries on the planet produce more than 150 million tonnes of cement each year: China and India. 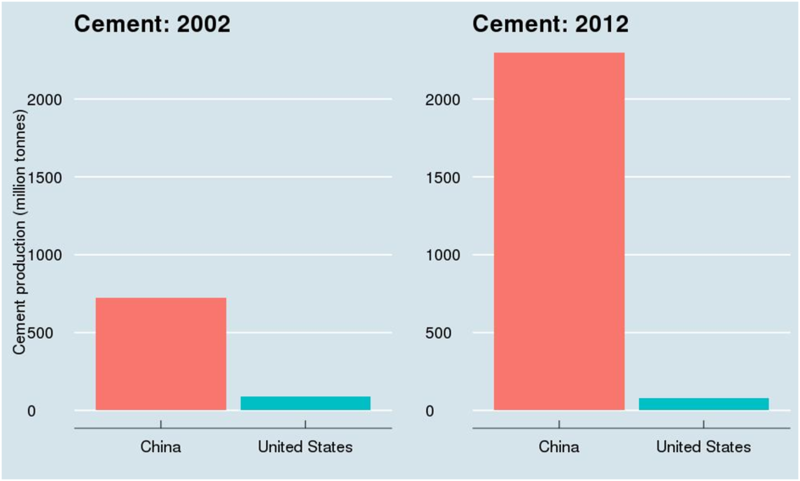 So as far as cement goes, China towers over America. It produces thirty times more cement each year, and its annual growth in cement production is about 50% higher than the total cement production of America. And China’s cement industry is now a significant contributor to global carbon dioxide emissions. 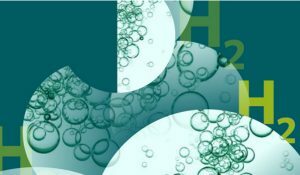 This industry alone emits around 1.2 billion tonnes of carbon dioxide each year, more than the total emissions of Germany or Japan. A simple rule of thumb is that if humanity makes something, then it is highly likely that half of it is made in China. This is certainly the case for steel, the most fundamentally important material for industrial civilization. Last year China produced 779 million tonnes of crude steel, 49% of the global total. In the space of a single decade China went from producing 20% of the world’s steel to producing half of it. The comparison with America is equally striking. 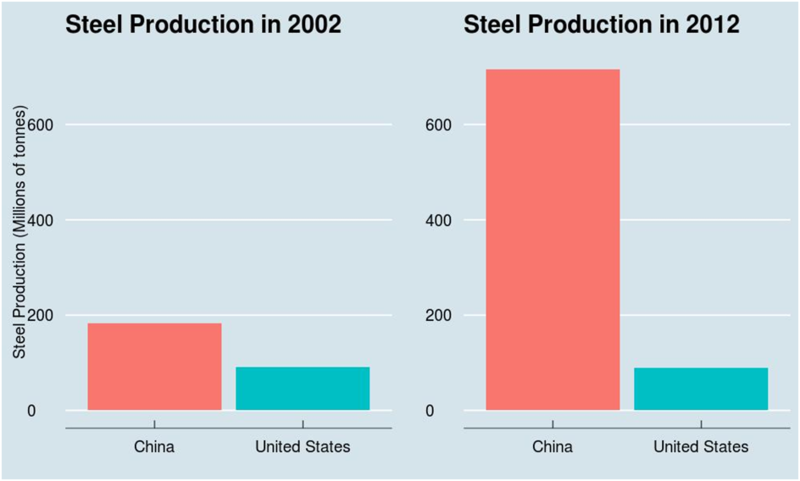 In 2002 China produced two times more steel than America, but by 2012 it was producing eight times more. Given that almost 7% of global carbon dioxide emissions come from iron and steel making, this has obvious and important consequences. China now produces ten times more aluminium than America does each year. This change in production ratio is even more stark than that for steel. 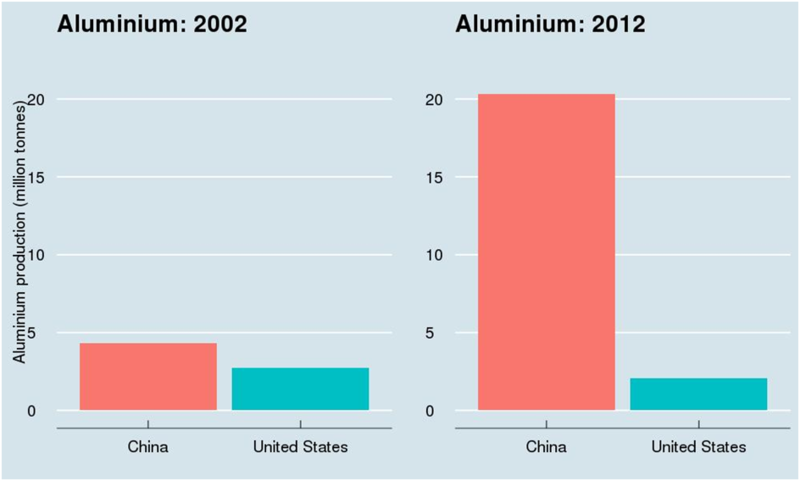 In 2002, China only produced 60% more alumnium than America. However in this period American aluminium production declined by 25%, while China’s increased by almost 400%. Modernisation equals electrification, and China’s electrification has been historically unprecedented. Between 2001 and 2011, China’s total electricity capacity increased from 344 to 1,100 gigawatts, and in some years it was adding a generating capacity the equivalent of the entire capacity of the German electricity grid. In contrast America’s electricity generation has barely budged since 2002, increasing only 5%. 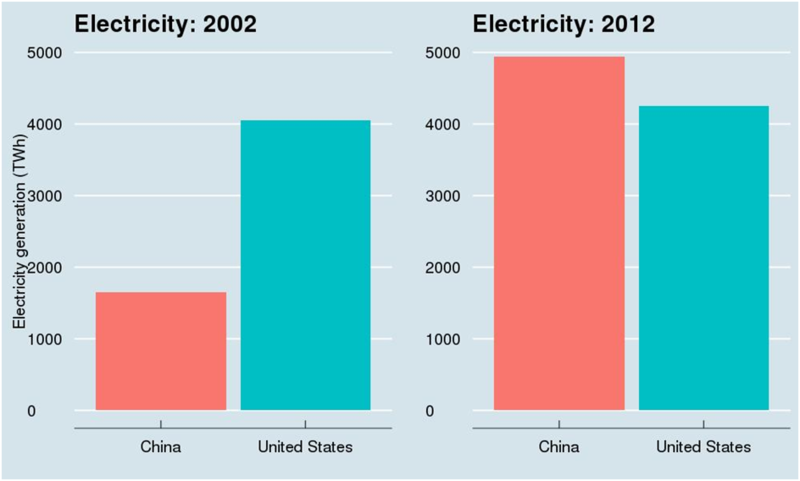 So, in only ten years America has gone from producing 150% more electricity than China to producing 15% less. This perhaps should be re-phrased: China has taken less than a decade and a half to build electricity capacity the equivalent of the entire American grid. And China’s demand is practically certain to continue increasing for the next couple of decades, while significant future increases in American energy consumption are questionable. It all adds up. China is now the world’s biggest consumer of energy and will remain so for a long time. In contrast American energy consumption is lower today than it was a decade ago. 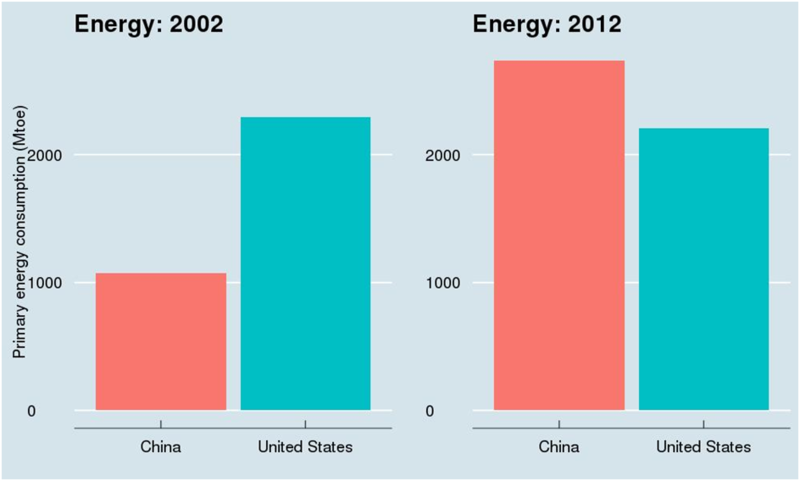 While China’s primary energy consumption increased by 150% in a single decade, America’s declined by 4%. One hundred years ago, the cheapest way to generate electricity was to take coal out of the ground and generate electricity using a steam turbine. After one hundred of years of supposed technological innovation, the cheapest way to generate electricity is to take coal out of the ground and generate electricity using a steam turbine. So, the rapid growth of China was not powered by wind, solar, nuclear fission, natural gas, or oil. It was powered by the same fuel that powered the British Industrial Revolution: coal. And most of the machines involved – blast furnaces, steam turbines, cement kilns – would have been recognisable to Thomas Edison. The challenges posed by a transition away from fossil fuels are best illustrated by the understandable preference of rapidly developing countries to use coal. And no-one has used coal on the scale of China. Today it consumes half of the world’s coal, about four billion tonnes of the stuff. America however is now using much less of it, with a decline of 20% between 2002 and 2012. Meanwhile China’s coal consumption grew by 160% over this period. In fact China’s annual coal production in this period rose by 2.1 billion tonnes. This is more than the total annual coal production of America, Canada, and the EU combined. 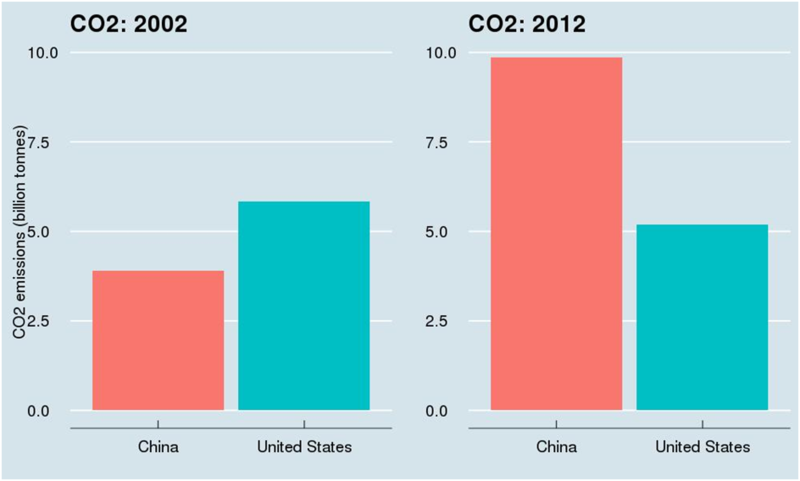 In 2002 America had carbon dioxide emissions 50% higher than those in China. 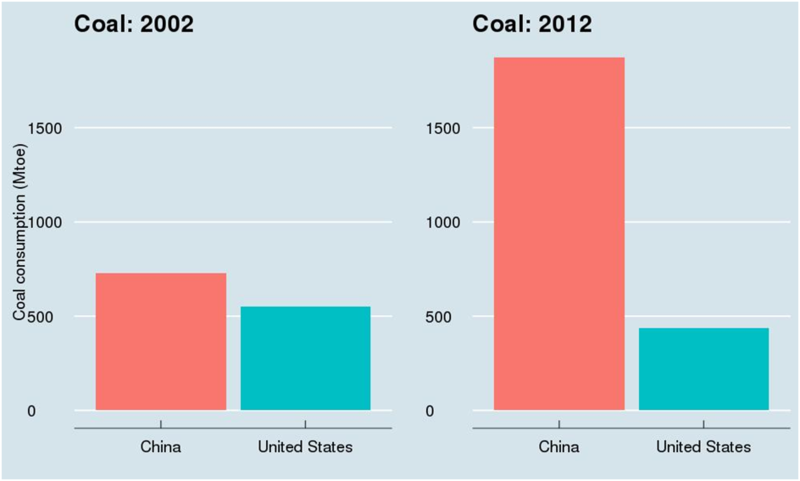 Yet, a decade later China produced almost two times more carbon dioxide than America. Not only this, but China now produces more carbon dioxide than America and the European Union put together. The latter’s emissions appear to be in long-term decline, while the former’s appear to be increasing inexorably for at least a decade, and probably more. 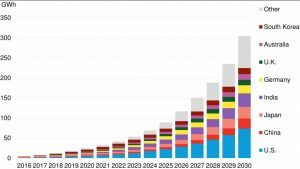 This then looks highly likely: a decade from now China will emit at least three times more carbon dioxide than America. I started off by noting that forecasting is futile, so I will not conclude with any form of precise forecast of the future. Instead I will make two rather illustrative statistical comparisons to put the possible energy futures of both America and China in context. Therefore, any rational American energy and climate policy should place reductions in per-capita energy consumption as a priority. Many people however look on this prospect as some kind of burden. This view is mostly a result of an unwillingness to look at basic facts. For example, carbon emissions and oil consumption in America’s transport system can be drastically reduced in a short period simply by improving fuel efficiency, and transitioning to diesel cars. The fuel efficiency of the American car fleet was essentially unchanged for three decades after 1980, while the average new American car is as heavy today as it was in 1970. The new fuel efficiency standards put in place by the Obama administration may be a few decades overdue, but they are a fundemental necessity. So, forget electric cars driven by millionaires, the priority for American transport should be an easy to make transition towards driving sensible vehicles. There is no real reason why America cannot transition to European levels of per-capita energy consumption. The evidence of the benefits of this excessive energy consumption is rather limited, but the evidence of its costs are rather clear. So why not make this transition? A comparison with Britain’s historical per-capita coal consumption is revealing. While China now consumes half of the world’s coal, its per-capita coal consumption is far from unprecedented. China now consumes around 2.7 tonnes of coal on a per-capita basis. However, Britain had per-capita coal consumption of 4.6 tonnes in 1913, almost two times higher than China’s today. In fact China’s per-capita coal consumption is actually lower today than Britain’s was 150 years ago. Therefore, unless China sees a reason to transition to other fuels, its coal growth is far from over. The long transition in Britain away from coal is sobering, and if repeated by China is likely to have grave impacts on the biosphere. 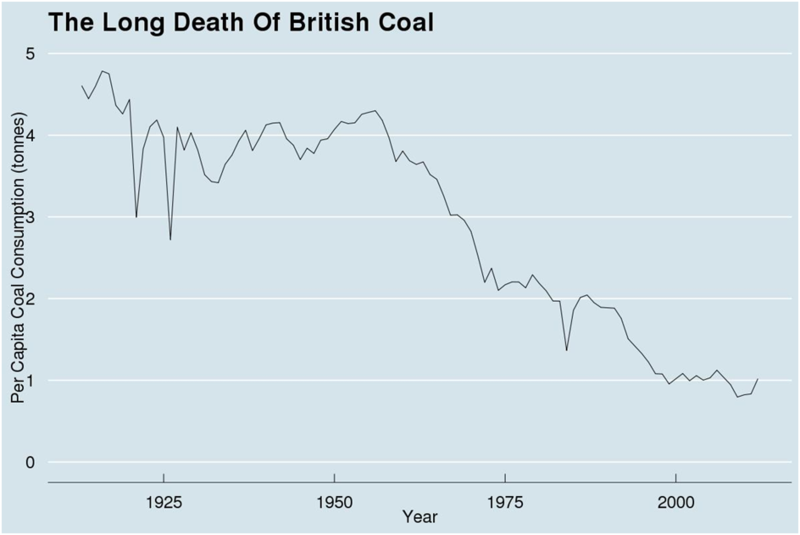 After peaking in 1913, Britain’s per-capita coal consumption largely plateaued for half a century. The prospects of things being drastically different in China are not particularly high. As Armond Cohen has pointed out it is practically certain that China will see a similar long plateau in coal consumption. This is made clear by some salient facts. Sales of sport utility vehicles (SUVs) in China are increasing by one million each year. Just over half of China’s consumption is used to generate electricity. Coal power plants however last a long time. Consider that the coal power plants currently being retired in America today are on average 50 years old. Almost all of China’s coal power plants were built since the year 2000. And given that China plans to build over 500 GW of new coal power plant capacity it is highly unlikely that China’s coal use for electricity generation will be significantly lower 30 or 40 years from now. And approximately 15% of China’s annual coal consumption, that is over half a billion tonnes of coal, is used to produce steel. The prospects of China producing almost a billion tonnes of steel each year without the consumption of over half a billion tonnes of coal is low to non-existent. Large-scale steel production still remains fundamentally dependent on the use of coal, and this is not likely to change soon. Coal therefore is here to stay in China, and for a long time. 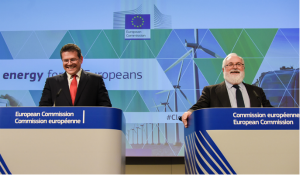 What nees to happen is a transition which focuses on low-carbon and lower-carbon energy for new energy generation, whether it is the use of natural gas in industrial processes, or the use of nuclear, wind and solar for electricity generation. There are some promising signs that China is half-serious about low-carbon energy, however new capacity additions of wind, solar or nuclear are far from stopping the growth of coal. However China must also do what it can to avoid a transition to American levels of per-capita energy consumption. America’s excessive consumption is best illustrated by the widespread ownership of sport utility vehicles. This is normally rationalised by alluding to the fact that America is a big country. Meanwhile most Americans use these vehicles to drive between traffic lights in cities. What is now happening in China? Sales of sport utility vehicles (SUVs) are increasing by one million each year. If you believe a decline in China’s coal growth will end its energy problems, you may be mistaken. 1. Cement production statistics are taken from the US Geological Survey. 2. Steel production statistics are taken from The World Steel Association. 3. Aluminium production statistics are taken from the USGS. 4. Energy, electricity and coal statistics are taken from BP’s Statistical Review of World Energy. 5. Carbon dioxide emissions data is taken from EDGAR. 6. Historical coal statistics for the United Kingdom are taken from DECC. 7. Electricity capacity statistics are from EIA. This compilation of consumption figures is revealing, but likewise reminiscent of the Cold War production tonnage reports from Soviet Bloc countries. 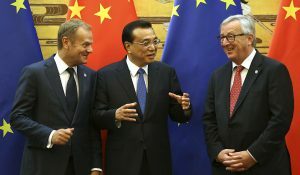 Quantity does not invariably translate to quality unless it is based on social consensus, which in Eastern Europe was overturned a quarter century ago due to unfulfilled ideological promises. The assumnption of enduring coal availability is similarly precarious, since its average thermal value has been declining worldwide since the 1990s. A growing ocean-going trade in increasingly low-grade coal signals the beginning of supply scarcity. Indonesia is currently the world’s leading coal exporter, but if the BP Statistical Review of World Energy is accurate, then rising demand from India and China will have completely depleted that country’s reserves within a decade. China has huge domestic coal resources, but most of them are too deep, too distant from the coast, and without local water supplies available for washing. 400 million people are apparently being resettled from rural regions to newly constructed megacities, helping to explain the high tonnage of cement and steel that would make any Western industrialist pale. This relocation program is roughly equivalent to replicating the entire EU infrastructure within China, and it will doubtlessly include amusement parks complete with the Eiffel Tower and Neuschwanstein castle. Europe is beginning to appreciate the market value of such surrogate dream fulfilment. The reference to British coal consumption in 1913 has called to mind the diminutive Porsche Cayenne factory in Leipzig, Germany, producing sport utility vehicles every 300 days with the combined horsepower of all the steam engines in the world in 1896. 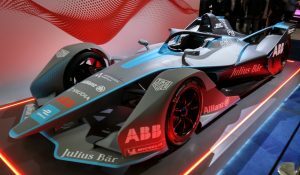 The top-of-the-line model has 38 percent more horsepower than a WWII Sherman tank, and countless numbers of Chinese are eager to buy it. The Asian virtue of moderation may be destined for obsolescence, but China’s continuing dependency on coal will have to be re-examined when CO2-induced ocean acidification begins cutting into fish protein supplies. Using Mr. Wilson’s simplified formula, half the demise of marine food chains may then be statistically due to Chinese carbon emissions.